On June 8th, Britain goes to the voting booths, and with the polls starting to narrow between the two major parties, the supposedly inevitable Labour wipeout is far from certain. Indeed, some Conservative sources are briefing that plans are even being made for a hung parliament. With an army of 700million 18-24 year olds primed and pumped to definitely get out of the house and definitely vote Labour, this seems like a sensible precaution to take. A Labour victory would mean many things, not least of all Jeremy Corbyn taking the keys to Downing Street. 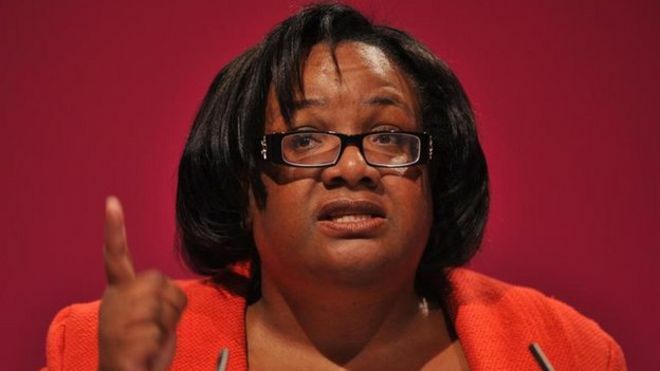 What I can’t quite get my head around is Emily Thornberry as Foreign Secretary (although I could have easily said the same about Alexander ‘Boris’ Johnson) and – worst of all – Diane Abbott as Home Secretary. Ms. Abbott has, so far in this campaign, committed a series of excruciating gaffes. These are not isolated incidents, as she has a rich history of cringeworthy interviews in which she invariably comes across as smug, self-serving and completely unbothered about whether she is actually answering a question put to her. However, she has been much derided for an interview she gave to Andrew Marr this week, derision which I think on the whole is not deserved. The whole clip can be found here and is definitely worth a watch. I want to examine this interview, and show why I think descriptions of a ‘car crash interview’ are well wide of the mark. Marr opens with a question on why she should be trusted on security, to which she responds (after a brief diversion about Manchester, standard politics which any MP would open with) with some nonsense about having worked in the Home Office as a graduate trainee, apparently giving her the knowledge of “how it works on the inside”. But she then talks about her work with diverse communities and having been a working MP for 30 years, giving her the undoubted experience of seeing how the work of the Home Office affects her community. This is (eventually) a perfectly reasonable response. He then moves on to chuck an old quote of hers about wanting to abolish MI5, her signature having been found on an early day motion calling for the “abolition of conspiratorial groups, not accountable to the British people”. She responds by saying that she wanted it to be reformed, it has now been reformed, and she would not call for its abolition now. Again, completely reasonable and a straight and clear answer. She even bats away Marr’s insinuation that “the old Diane Abbott has gone” by correctly asserting that it is not her that has changed, but MI5, allowing her to now support it. The next point is around Abbott having voted “around 30 times against anti-terrorist legislation”. Now, this is one for me that I can’t stand hearing about. I hate it when it is used against Labour MPs, Tory MPs and Lib Dem MPs because it simply isn’t fair. It is also this kind of question and fear of its reprisals that turns perfectly intelligent and thoughtful MPs into self-serving, robotic lobby fodder. Legislation is very carefully crafted, often to try to trick or pressure opponents in a particular way, and so to boil down 30 (what would have been huge and wide ranging) pieces of legislation and use them to imply that Abbott is against anti-terror provisions is frustrating. She may have been wrong to vote against these, but we can’t know without examining each one carefully. Alas, not something that can be done in a 12 minute interview, but I would always urge you to look into these things further (and for complete integrity, do it for the Tories as well when they’re attacked in a similar way). She makes this point brilliantly when Marr puts his next question, which relates to her having voted against proscribing Al-Qaeda as a terrorist organisation before 9/11. She calmly asks him if he has read the legislation he is referring to (he has). She explains that some on the list were, she thought, freedom fighters and dissidents in their countries, and so could not vote to proscribe them as terrorists. She may be right about this, she may be wrong, but it illustrates perfectly the issue with having one vote to cast on a wide variety of issues in one bill. After he puts it to her that “no list is perfect, but this is a pretty good list”, she hits back by explaining that she couldn’t possibly vote for it whilst she considered some of those groups to be legitimate dissidents and voices of opposition in their countries. Whether you think she was right or wrong to vote the way she did, she correctly points out that, “you have to give people credit for thinking about how they vote”. This is a more important quality in an MP than blindly following their party whips, and I have huge respect for it. We move into murkier waters regarding support for the IRA. I won’t get into too much detail here because I could write for ages, but suffice to say I am not with her (or Corbyn) on this one – I do consider her to have supported the IRA against the British state, and with a group that brought such horrible violence, I don’t think this is defensible. The nonsense about her concurrent change of hairstyle and views are obviously ridiculous, but she dodges the real question, claiming simply that she “has moved on”. This is slippery and doesn’t look good. The only dark spot in an otherwise solid interview. Next, it is put to her that Amber Rudd “spends 2 hours a day” signing orders for various activities requested by the police – would she do the same as Home Secretary? Her response is, for me, perfect. “If it’s put in front of me and there is sufficient evidence, of course I will.” What more could we ask of her? On the question of tech companies like WhatsApp that provide communication tools, I couldn’t be more opposed to her. She peddles the same nonsense as her opposite numbers across the house about the companies working with the British government to access messages. She recognises there are ‘issues’ with end to end encryption, but she seems to misunderstand (perhaps deliberately) the nature of the thing…it is either encrypted or it isn’t. If you let the state access it, other people could do as well. I oppose any moves to open these things up, and her use of the Manchester attack to push this point is naked political posturing using a tragedy – something she has had no issue with accusing her opponents of. However, this is her view and it is clear and concise. We are free to disagree, and I do. The issue of DNA databases is raised, with her apparent opposition to having even guilty people’s DNA on the database put to her. She explains that she has had children in her constituency who have never even been convicted of any crime who have their DNA on there. This seems to be a gross violation and, certainly in that case, I would support her opposition. The rest of the interview focuses on police numbers (during which she actually knows her figures – a refreshing change) and how she would run the Home Office as a black person (how that is relevant I have no idea, and to her credit she bats it back by saying she would run it as best she could, same as with everything else). Overall, this was a creditable performance and, despite having disagreements with her on several points, she came across as reasonable, professional and competent. I would have my misgivings about seeing her in the Home Office, but following this, some of those have disappeared. She has been roundly criticised on social media for this interview, but I cannot see why. Corbyn and Abbott do have serious questions to answer about their past IRA support, but that can’t be the only thing we take into consideration about them, especially given how long ago it was. If we don’t allow people to change and adapt, we only reinforce our own prejudices and push people into corners, and that’s not something we should seek. She has, in the past, been evasive, slippery and simply ridiculous plenty of times. But those times when she isn’t need to be credited. It is only be doing this that we encourage our elected representatives to do it more often. If this is seen as a car crash interview, why should she ever feel like she should be clear or straightforward with us again? We must give credit where and when it is due. This applies to ALL parties and ALL MPs. If we don’t, all we will get is an army of dreary, whipped Michael Fallons. And we would deserve it.